Recently I went back to streaming and tried to improve my setup and use Streamlabs OBS (SLOBS), a variant of the popular Open Broadcaster Software (OBS) which includes a really nice app for iOS and Android which lets you control you broadcast. My only issue about SLOBS (and/or OBS) in general is when you stream some games, its a hit or miss experience. Most of the reported issues include a black screen (but with audio) or in my experience, frozen frames as I transition from one part of a game to another. I had the time to do some trial and error testing yesterday and listed below is the pre-requisites and some quick summary of my setup. Take note of the terminologies used throughout this post. SLOBS/OBS - Streaming software, liberally used interchangeably in this post. Source - This is where an input of OBS is coming from. This can be a webcam, computer screen, full screen application, a webpage, an image, etc. Game Capture - Captures several types of game windows, any full screen application, target app, etc. Blizzard games - Anything launched within the Battle.net launcher. This includes Diablo 3, Overwatch, Starcraft, World of Warcaft, etc. Other games - Any other game outside of Battle.net titles. New game, new stream - If you are changing a game, it is advisable to stop the stream, close the game, start the new game and start a new stream. I had issues where OBS failed to capture the new full screen application after relaunching, at times even the display capture fails to stream it properly. Disable overlays you don't use - The only overlay I want is the MSI Afterburner so that I can track my CPU/GPU usage and temp when I'm watching my recording. The NVidia game stream overlay and the Windows 10 Game Mode should be disabled since OBS tends to panic with so much overlays. Disable anti-cheat hook - Disable the anti-cheat hook for game capture. This is one of the recommendations found from scouring the forums about black screen issues. In my SLOBS app, I start with the Stand By scene and just toggle to the other scenes as needed. Please keep in mind that the tests performed here is not a complete and exhaustive test on what works for what games all the time. It is always better to preview your OBS using a second monitor or hope that the SLOBS mobile app would include a feature to preview your stream before hitting that "Go Live" button. 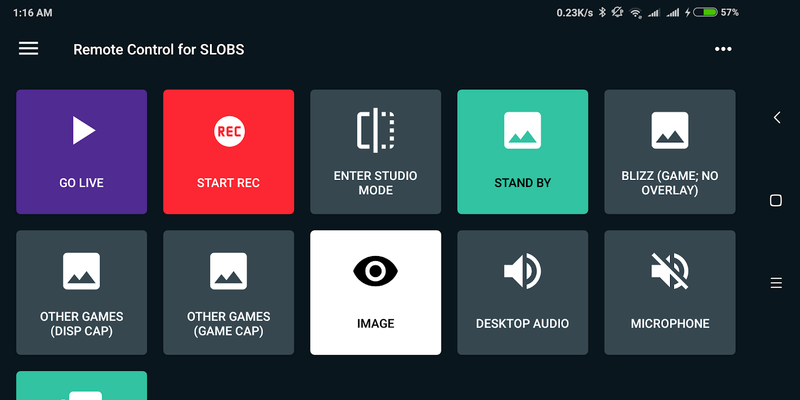 The combination of SLOBS desktop and mobile app completely removes the need for an expensive device like an Elgato Stream Deck. While it is lacking in some of the aspects like: Why cant it properly handle overlays? Why does it panic if you have too many of the same sources in too many scenes? For a free application, I'm not one to complain. I do feel that at times it is disappointing to go back to my stream and see that nothing was captured.